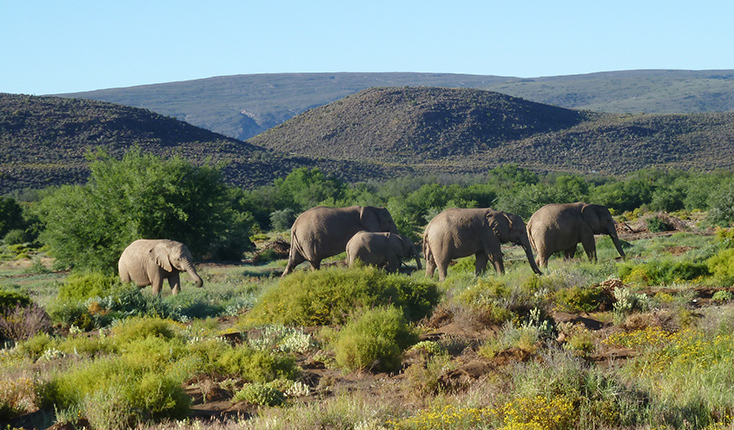 with the flora and wildlife in the spectacular hinterland of the Little Karoo and the mountainous coastline. Evening departure overnight to Cape Town with British Airways or with South African Airways via Johannesburg. Possible to upgrade to Business Class or to have more legroom. Morning arrival in Cape Town and you will be met by Susan. 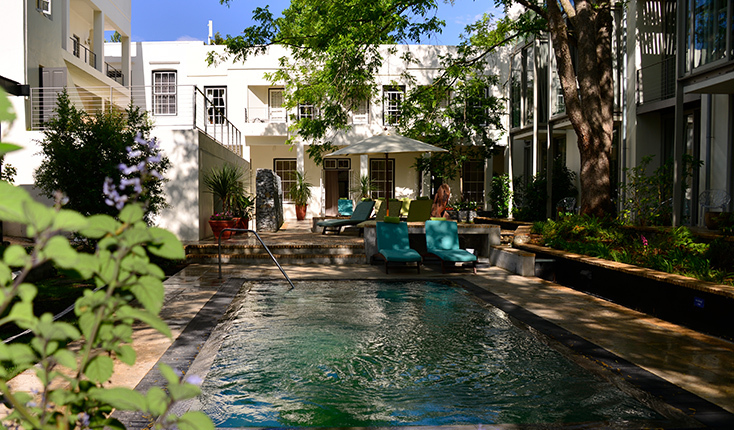 Short transfer to Hotel Oude Werf in the historical centre of Stellenbosch (6 nights) where the streets are lined with oak trees and the jacaranda are just starting to flower. 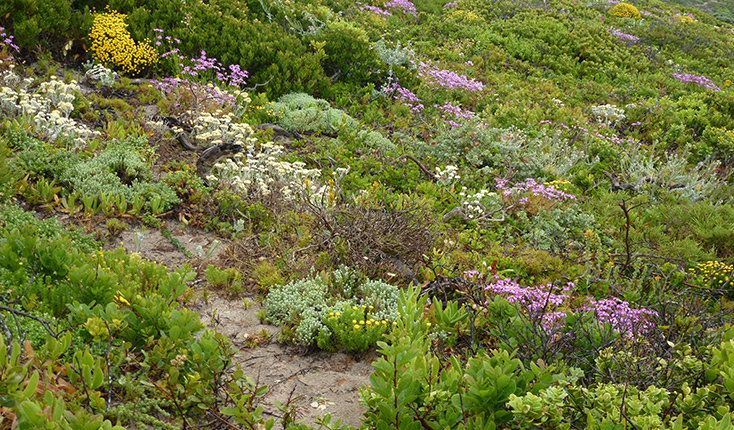 For lunch we walk to the well laid our University Botanic Gardens and then enjoy a guided introduction to the Cape Flora. Aperitif and short talk on the programme in the garden before enjoying dinner together. We spend most of the morning in the Elgin district where many apple orchards are found. Visit to a private garden of great plant collectors and propagators. Their woodland garden is a profusion of climbing roses. The indigenous wachendorfia and tall blue aristea are particularly striking. After lunch we take the road over the fynbos covered mountains descending through Fransschoek. Return through the mountains and the Franschhoek valley lined with rows of vines to visit Dylan Lewis’ garden beautifully planted to display his sculptures, his mountain leopards inspired by the hinterland of the mountains. Evening at leisure. 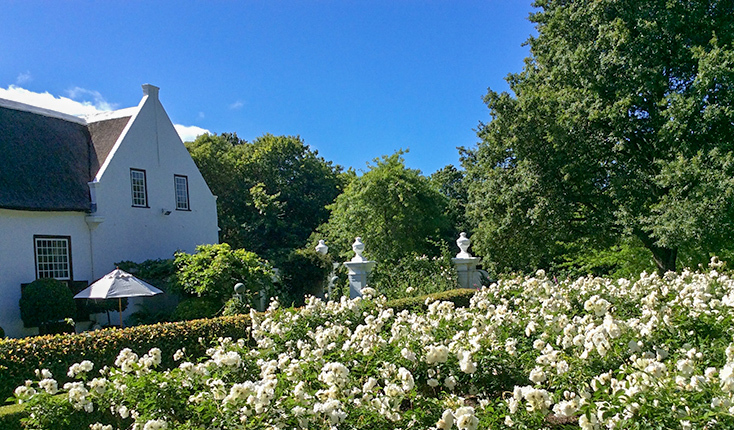 Morning visit to the Rustenberg wine estate gardens renovated by Rozanne Barlow who shows us her own delightful manor house garden at Schoonzicht. A tasty picnic with Rustenberg wine is enjoyed in the shade of the stone pine trees on the estate with fabulous views to the Hottentot Holland mountain range. Afternoon visit to the superb terraced gardens at Old Nectar in Jonkershoek Valley created by the late Una van der Spuy, a renowned rose grower. Evening at leisure. 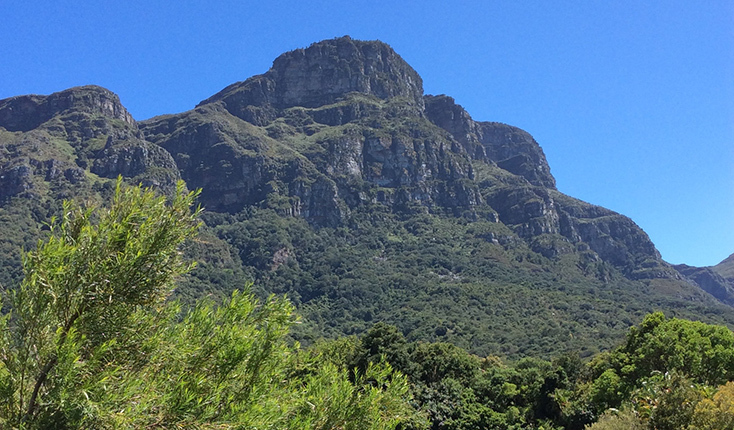 Kirstenbosch, at the foot of Table Mountain, is a magical garden with exclusively indigenous flora except for the avenue of Camphor Trees. We are guided through the main parts of the garden and discover the treetop walkway. Lunchtime in the garden. 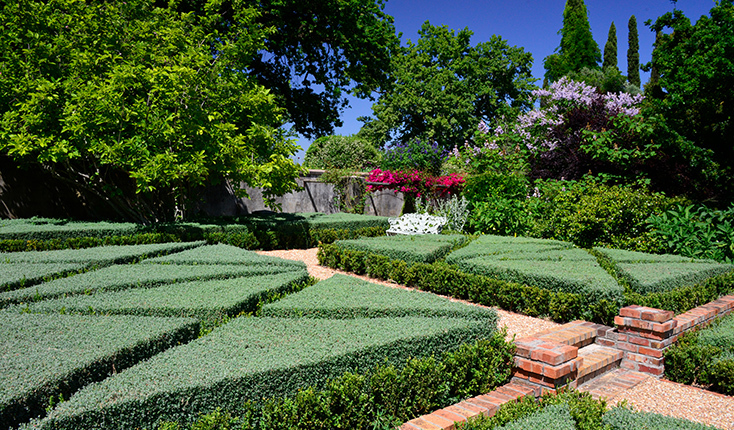 Afternoon visit to Sandy Ovenstone’s outstanding garden, Stellenberg, her Cape Dutch manor house near Cape Town. David Hicks was involved in some of the design and the Ovenstone’s recent restoration along the stream is inspiring. We return to the hotel and enjoy dinner together at a nearby restaurant. The exceptional gardens at the Babylonstoren wine estate in the Drakenstein Valley have been recently created by Patrice Taravella of Prieuré d’Orsan, principally designed as a potager garden. Liesl van der Welt, head gardener/curator will show us around with great enthusiasm. We enjoy lunch in the farm’s wine tasting restaurant with dishes made from their garden produce. The Helsgroote Pass is renowned for its wine growing. 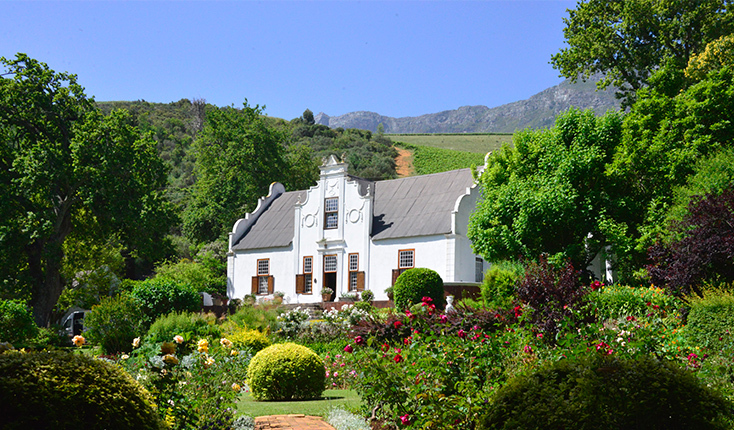 We visit a prolific private garden of a wine estate. Evening at leisure. 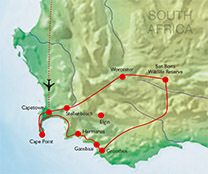 Cape Point and the Cape of Good Hope are in a vast natural park and fully protected. 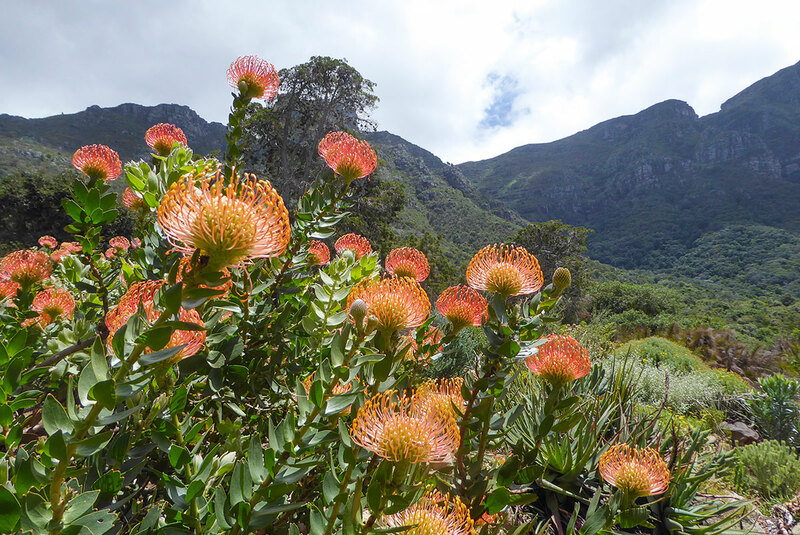 Accompanied by a local ecologist, Uschi Pond, we take the eastern coast to the park, enjoy a walk to discover the extensive fynbos and wildlife – rock hyrax, zebra, ostrich and bontebok may be seen and a multitude of seabirds. Return on the dramatic western coast. On our final evening we enjoy dinner in the hotel restaurant. 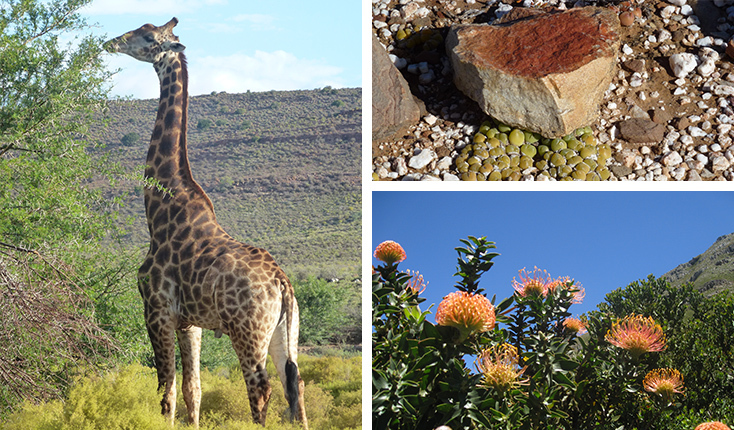 Depart Stellenbosch (with luggage) across the mountains to the Worcester Desert Botanic Gardens to discover Karoo vegetation. Continue along the Route 62 to Montagu and enjoy a picnic lunch. At the entrance of Sanbona, we transfer to Land Cruiser vehicles to drive to our lodge. 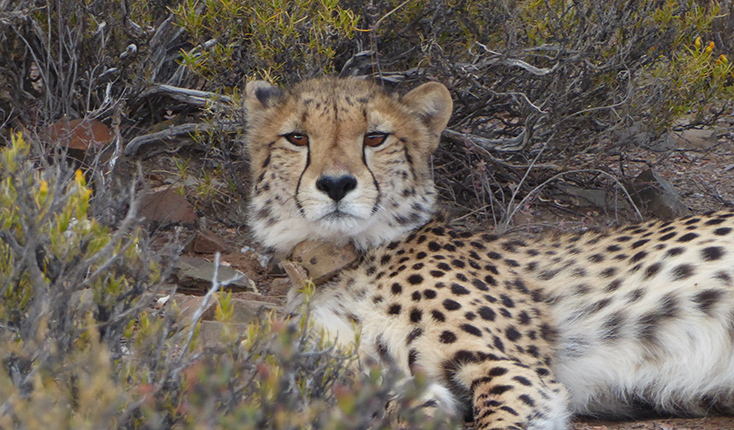 Late afternoon game drive on the reserve to experience the rich variety of game and wilderness. After a sundowner we return to the lodge for dinner. Early morning game drive returning for breakfast and time to relax. Possibility of seeing elephants, a pride of lions, giraffe, springbok, kudu and the white rhinos re-introduced after well over a century to this vast conservation reserve. Late afternoon drive in the amazing Little Karoo fynbos to the dam where hippos can be seen. Dinner in the lodge. Early morning we discover on a nature walk both fynbos plants endemic to the Little Karoo and the ancient rock art of San people indigenous to the Karoo. Return for lunch and time to relax. Afternoon game drive with a sundowner before enjoying dinner together. Depart by Landcruiser to the entrance transferring to our minibus. We traverse the spectacular Tradouws Pass in the Langeberge mountains and on through vast cereal farmland during the harvest season. Chance to see blue cranes and francolin. Arrive in the afternoon at Grootbos Reserve above Gansbaai on the coast. 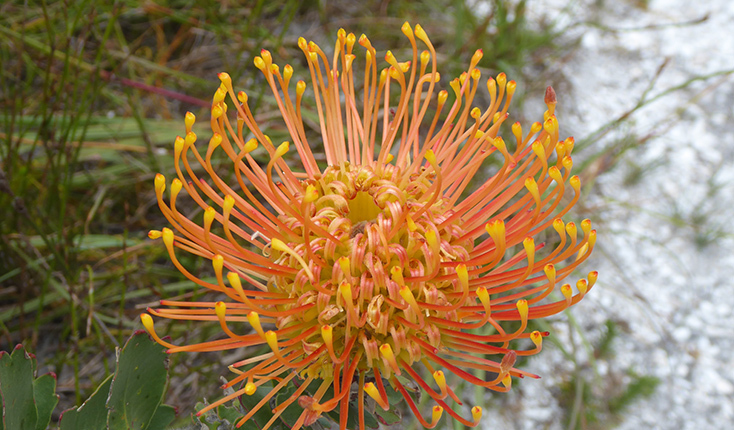 We meet our specialist guide for an introductory walk in the fynbos. Sundowner on the terrace overlooking Walker Bay before enjoying dinner together. After breakfast we drive into the hills with our guide to discover the profuse coastal fynbos, and perhaps some springbok and baboons. After lunch we go down to the coast hopefully to spot the Southern Right whales just off the cliffs. Time to relax or walk in the milkwood forest before dinner. We depart in morning (with luggage) to visit the Harold Porter Botanic Gardens and the indigenous penguins on the coast. We then take the scenic coastal road to Cape Town airport for the return overnight flight. Arrive in the early morning at London Heathrow airport. All land transport, accommodation in high quality hotel/lodges, delicious meals where shown. Sundowner drinks on reserves. All National Park entrance fees, garden entrance fees and local guides. 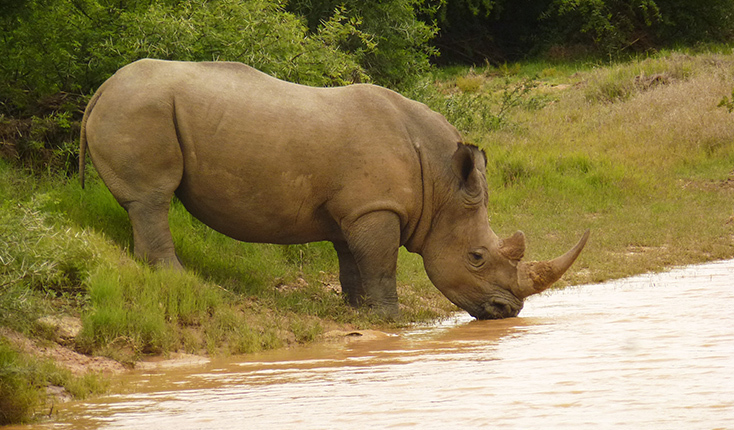 Alcoholic and soft Drinks, driver’s tip, tips at hotel/lodge, game drive ranger tips, items of a personal nature. Full travel insurance. Rooms at the Hotel and Lodges are luxurious with all modern conveniences ensuite with stylish furnishings and a comfortable bed. Mostly level paths in gardens, some steps. Nature and game drives in Landcruisers. The climate is delightful, November being early summer. The days are warm at about 24ºC and the evenings are pleasant. Insects and mosquitos are not evident but insect repellent is recommended. Sun screen and a sun hat are essential. A waterproof jacket is suggested in case of rain. Sturdy shoes and a fleece are a must for early morning game drives. Neutral colours are preferable for the game drives. Wifi is efficient throughout the Cape. The areas we visit are safe, the local people are friendly. Afrikaans is spoken widely but everyone also speaks English very well. The tour has been well researched personally by Susan Worner. 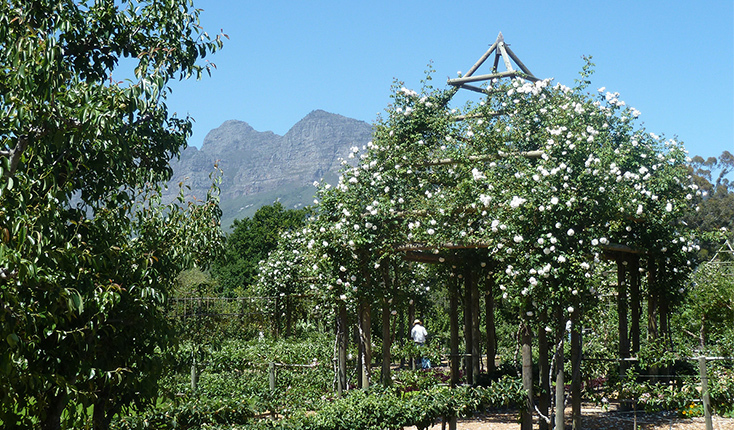 This is an alternative itinerary to the Garden Route, a misnomer, as the superb gardens are in the Cape Town area. The reserves are chosen as the best in the region and both underline the conservation aspect of the indigenous flora and wildlife and give an insight into the wild, beautiful hinterland.